Two men pose for their portrait at the Flaten Studio in Fargo, North Dakota. 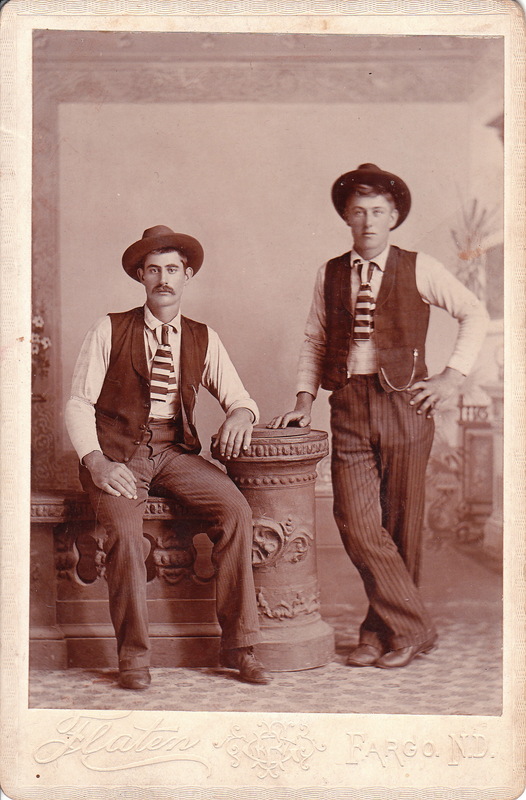 The men are well dressed and may be wearing identical outfits because they are in work clothing. They are looking quite handsome in their striped pants, vests, ties, and hats. Perhaps a visitor to the site may have a hypotheses concerning the reason the men are dressed alike. The date of this photograph is sometime after 1889, as before that time, the address of the studio would have been listed as “Dakota Territory”. To see other photographs by Flaten, click on Cabinet Card Gallery’s category, “Photographer: Flaten”. There is no concrete evidence that the Flaten in Fargo is the same gentleman as O. E. Flaten (the photographer of the other images in the “Photographer: Flaten” category), but it is certainly a reasonable possibility. The Flaten in Fargo is the same gentleman as O.E. Flaten. He was my great,great uncle. Thank you for sharing some of the history concerning the Flaten brothers. The cabinet card gallery has four photographs from the sibling photographers. Type “Flaten” in the site’s search box to see these examples of their work. One of the photographs is from the Fargo, North Dakota studio while three were produced by the studio in Halsted, Minnesota. Just to make the point that the trousers, although similar, not identical.